A more detailed view on the happy/sad pin orientation that I briefly mentioned in the pin-locks post. Thanks to Todd from Apex for pointing this out to me. Since I had a hard time wrapping my head around the whole thing I made a few pictures to make sure everyone knows what I’m talking about. The first two pictures show pin and bridle on a packed rig as if you could look through the bridle. 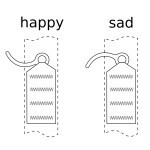 Happy and sad pin orientation. 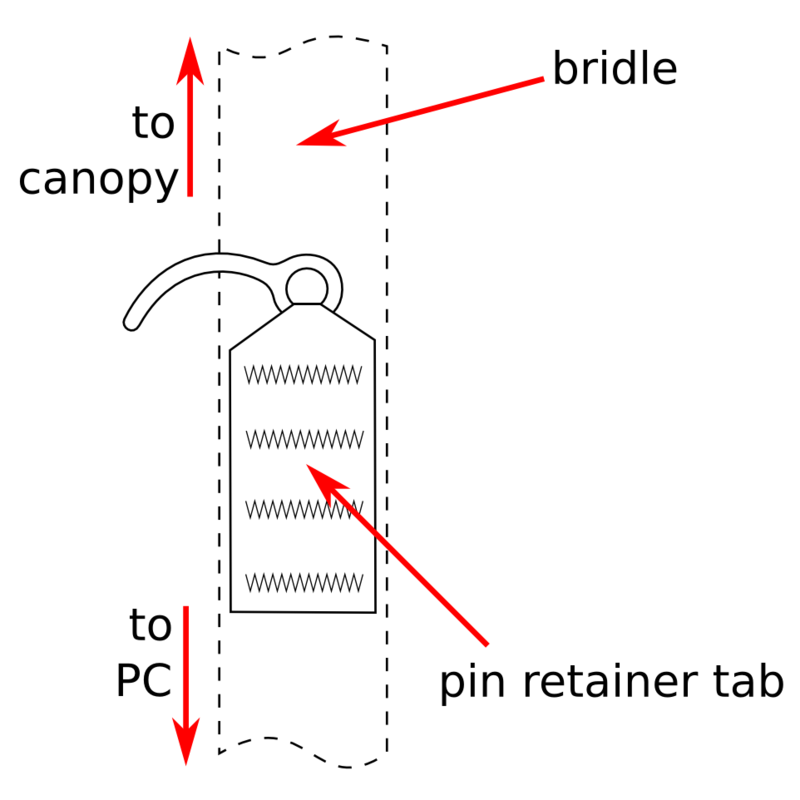 The pin retainer tab is the piece of webbing that holds the pin on the bridle. 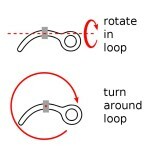 Rotating the pin in the closing loop vs turning it around the closing loop. 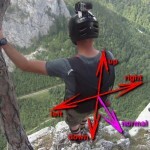 When flat and stable the bridle will pull in “normal” direction. Scenario 1: The pin is “sad” and retainer tab sits on the bottom of the eye of the pin like in the pictures above. When pulling the bridle straight up and away from the container, therefore force is applied in “normal” pull direction the pin will first rotate in the loop and then slide out of the loop. The force required to pull the bottom pin of my slider down rig (the one in the pictures) in this scenario is approximately 0.25 kg (~0.5 lbs), the pins were fully set. Scenario 2: The pin is “happy” and retainer tab sits on the bottom of the eye of the pin like in the pictures at the top of this post. When pulling the bridle in “normal” direction, the pin cannot rotate in the loop like in scenario 1 because it’s tip tries to dig into the container, levering against the force applied by the bridle on the eye-end of the pin. So the pin has to turn around the loop before it can start sliding out of it. At higher airspeeds this is going to be less of an issue due to the increased pull force of the PC (and changing angle of the applied force as soon as you start moving forward / tracking / wingsuiting), but can become a problem if you’re doing short delays where you don’t want to have any hesitations in the opening process. Scenario 3: The pin is pointing straight up. 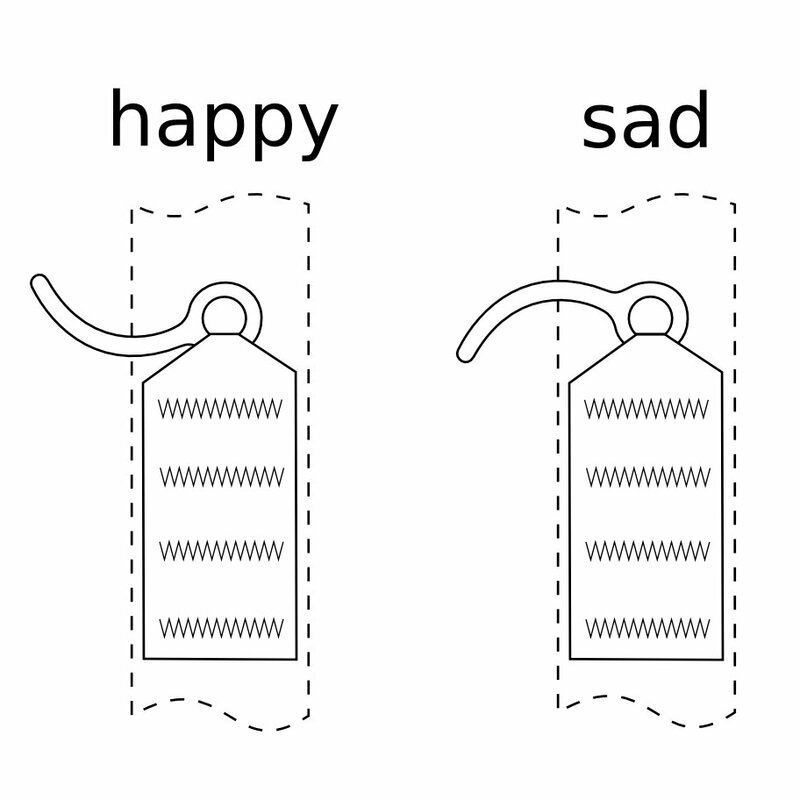 In this case the pin will turn in the loop to either, a more “sad”- , or a more “happy”- orientation, whichever is closer. From there scenario 1 or 2 applies. To sum this up. Pin orientation matters! Do a pincheck before you jump, have the pins in a “sad” orientation, and if you’re going for a short delay, prime the pins, and leave your pin protector flap open. Wouldnt it be safer to have a pullout on the base rigs? 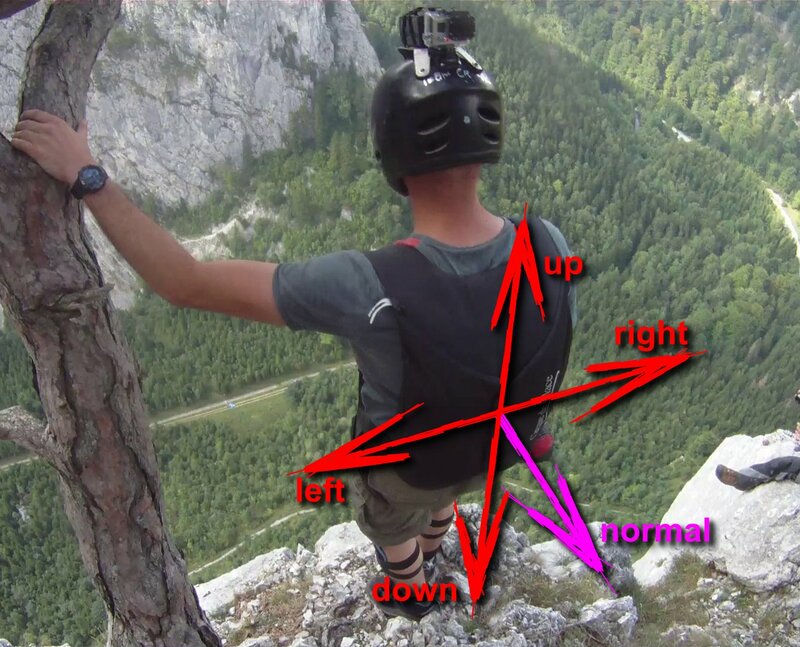 That would give you 100% chances of not having a pin lock….which could be fatal in base jump….or is it just a silly question? I thought that especially on low jumps it would be a bit safer no? – a good and strong toss of the PC is favorable in base for most situations which would’nt be possible with a pullout, leading to way higher risk of PC ending up in the burble. – there is a potential risk of entanglement of the pullout with the PC. – going handheld is’nt possible with this setup. Too bad that “happy” implies a bigger force, and “sad” less force. It just forgets to add one more point: fundamentally, what matters is whether the fabric in the eye of the pin, is pulling near the axis of the hole through the loop, or whether it is pulling from further away. When it is pulling from further away from the axis, then the pin rotates up away from “flat on the rig” easily — as when the fabric is pulling from the “top of the smile”. When pulling near the axis, it is more like prying up a straight pin, and it takes a little more force to get the pin to flip up away from the rig, whether by rotating the pin or having the fabric twist and move around the eye to where it can pull the pin easier. For all I know about BASE bridles, the extension from the bridle to the pin may always be on the same side, so the sad orientation may always be better, and that’s what the author cares about. But for bridles and pins in general, it will depend on which side of the eye the fabric normally lies. Sorry, I did miss that the position of the retainer tab in the eye was mentioned! 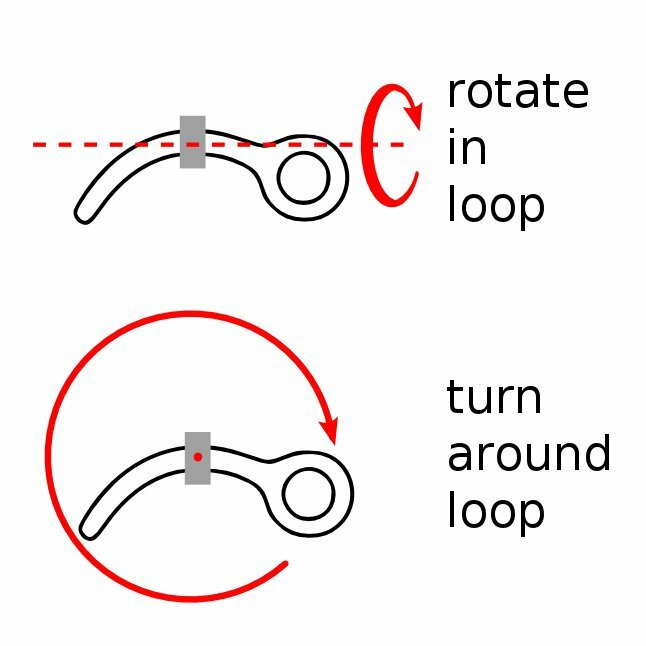 … It is in any case a point which needs reinforcement, as the location of the tab on the eye dictates which pin orientation reduces the force. Yes, exactly. The relation of tab to the pin, therefore where in the eye the tab sits dictates the best orientation. 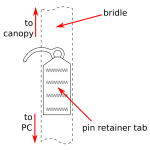 However, on pretty much every base bridle (besides a few exceptions like floating pin bridles), the pin retainer tab that holds the pin points towards canopy (the bartacked end of the tab points towards PC), so the whole “happy”/”sad” thing is based on this and also the pictures show it like this. The manufacturers also make the bridles the “right” way round to fit their containers (since you can mirror the whole thing eg. if side flap order is the other way round), so bridle and pin lays down like in pictures shown above.